Yes, we enjoy taking on new projects. Use the online form above to start the conversation about your project. We have a wealth of experience at improving an inventor's personal or team patents. See some of our current projects below. Our Metal Patent Art offering is a beautiful, one-of-a-kind tribute with a real artistic flare that is perfect your Patent Art. If you have a special treatment of our patent art that you would like to share with us, please do not hesitate to send us pictures and/or your feedback. Kristie Finished Our 1925 Harley Chalkboard Print. We Like It! I recently completed a project for an inventor who was team lead or team member on four different corporate patents. There were two specific requests from his wife who authorized this project as a Christmas gift for her husband. First, include all of patent illustrations. The first patent had five, second had eight, third had eight and the fourth had nine. Produce four 14 x 11" metal prints in the color of her choice. Both of these objectives were met to the satisfaction of this couple. This was a challenging project that I really enjoyed.
" ​Finally got the chance to unpack my final product and take a look and I couldn't be more pleased! Thank you so very much for your attention to detail. They exceeded my expectations and the mat is the perfect touch! Love them and I don't know how I'm ever going to be able to wait till Christmas to give them out. Looking forward to working with you again in the future." " My wife originally met Brian at the Northville (MI) Farmer's Market with her sister. She was fascinated by his work and thought it would be a great idea for a birthday present for my dad. My father is a police officer and has had a passion for firearms for as long as I can remember. She was in contact with him about two special guns he has used as a police officer. At first he could not find the patent on the second gun, but stated he would do his best to locate it. Brian did indeed come through!! We framed them and gifted them to my dad. He was immensely pleased. He thought is was a unique gift. He loved them! I got to meet Brian shortly after my dad's birthday and got a chance to thank him. You can see the passion in his face as he talks about what he loves and to see his customers happy. Not much of this is left in customer service these days. Thanks goes to Brian!" Charles Roscoe is a very accomplished local inventor. During his career with both Eaton and Dana he developed or co-developed four patents and even contributed some of his own drawings, seen above. Even though he had received a simple wooden plaque for each of his four accomplishments, Charlie asked me to embellish his work into four custom 13x19" prints that incorporated all of the illustrations from each patent. He selected mattes from our matte vendor and was very pleased with the final product. We have completed a number of inventor-requested projects. We met Jeff when we were selling at the Franklin Park Mall. Jeff wanted to memorialize his patent. After he described what he was looking for we recommended a 16x20" metal print. The two pictures of the same patent show the navy blue metal print of his vineyard stake patent. Jeff was very pleased with this treatment. ​Kathleen, a fellow crafter, asked us to find her Pop-Pop's patent early in 2017. We were successful and Kathleen was touched. Be sure to take a close look at what she did to complete our Patent Duo that we generated at her request. Adding his picture, title and tools of his trade was a great memory for Kathleen and her family. A young gentleman approached us at the Old West End Art festival with our first request to find vintage petroleum art for him and other petroleum devotees. We discovered a couple of vintage items. 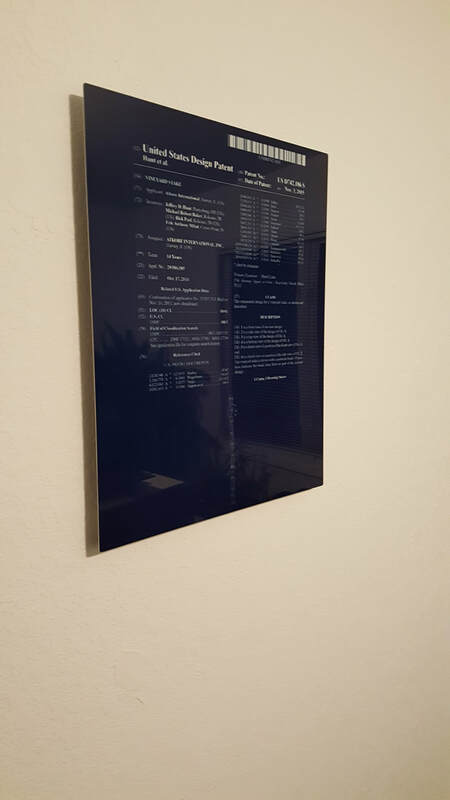 We enlarged and matted the patents into a set of two for his living room. 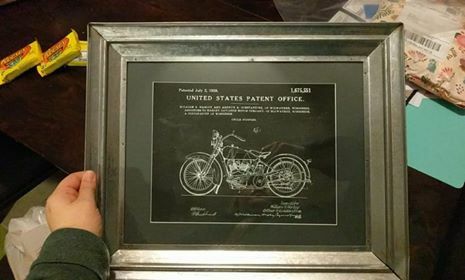 Randy found a couple of great barnwood frames that look great with this patent art. Randy was kind enough to share a picture or two of the final product. The red mattes really look great with our featured "aged paper" background. 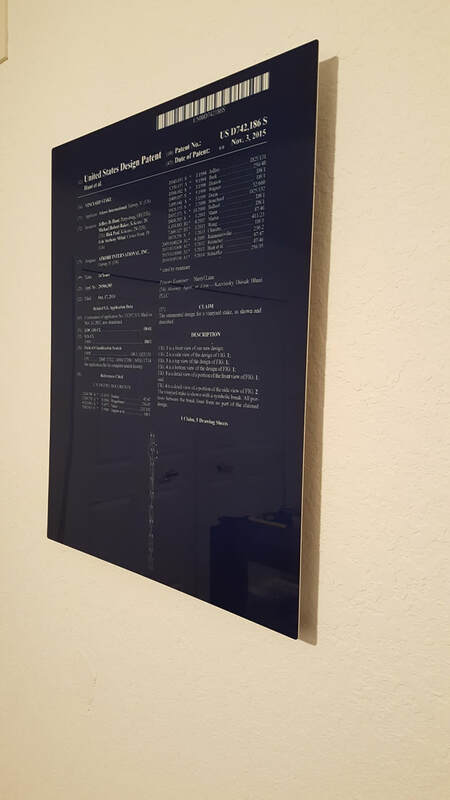 A customer of ours was kind enough to send us pictures of how she finished our 12x16" patent prints for her bathroom. Nice, right?